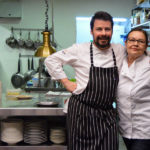 The ascendance of Spanish gastronomy has largely had a Basque signature, which, together with the Catalan scene, is seen as the vanguard in Spanish haute cuisine. 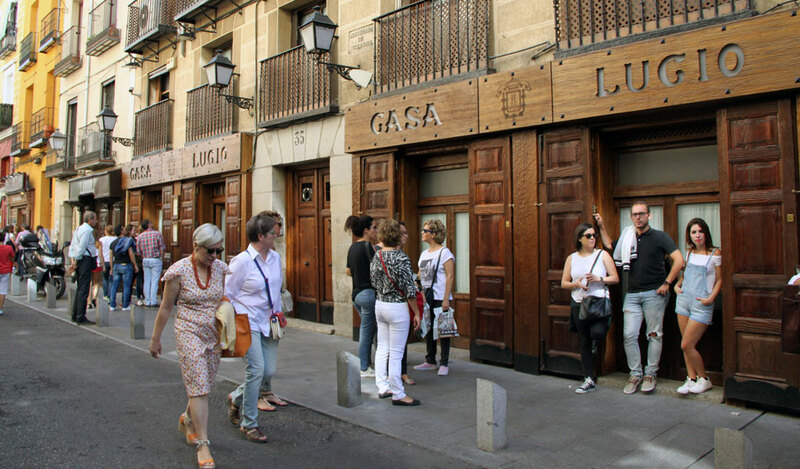 But while Nouvelle Basque has gotten all the spotlight lately, the food culture of this northern region has always been outstanding, thanks to its abundant rains and a territory that encompasses the Cantabrian Sea and Ebro River. 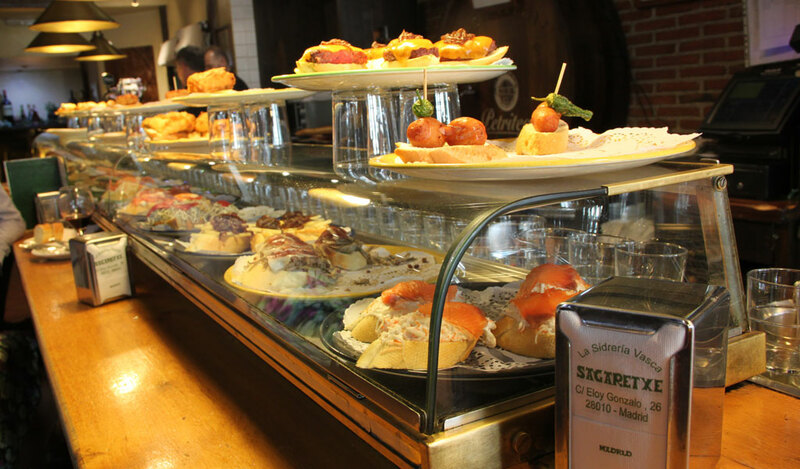 Basque taverns are largely known for their pintxos, a kind of tapas that are more sophisticated in taste as well as in design. At certain times of day these small plates fly nonstop out of the kitchen, usually chosen at the chef’s discretion. It is rare to find a pintxo menu, as you usually pick from what’s displayed on the counter. 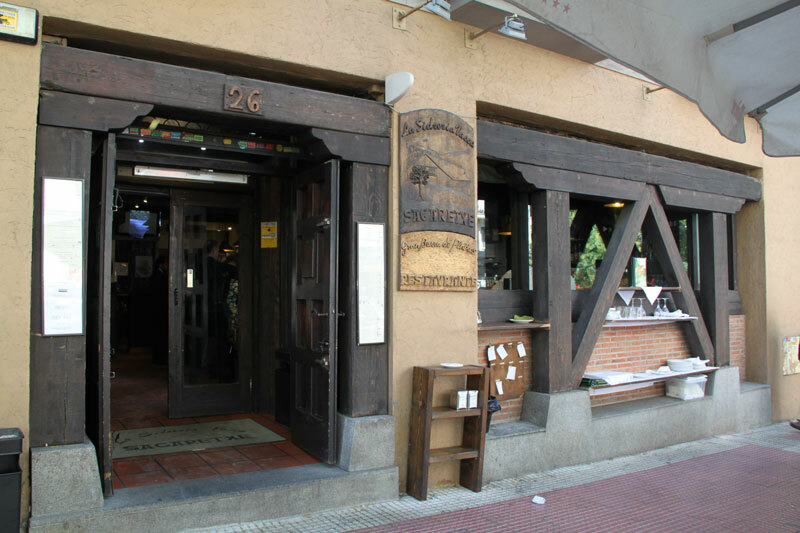 A pintxo pioneer in Madrid is Sagaretxe, a Basque bar, restaurant and cider house that opened at the end of the 1990s. 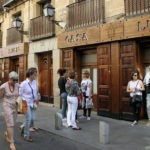 Located in central Chamberí – a sought-after, upmarket residential district due to its many examples of Modernist architecture and vast array of restaurants and boutiques – Sagaretxe is an excellent choice for experiencing the classic Basque ritual of eating pintxos and drinking cider. The bar’s name comes from the Basque: sagar (apple) and etxe (house). The preparation of cider has old antique roots that the word ‘sagar’ is common in many local surnames and toponyms. During the Middle Ages, it was a common drink associated with sailors (it was more accessible than wine); in Guipúzcoa – the heart of Basque Country – and it’s said that cider’s decline was exacerbated by the decadence of whalers, who would take many barrels on board their ships. But since the 1980s, the beverage has been experiencing a solid revival. The act of pouring the drink itself is a holy ritual in Basque Country, as much as it is in the northwestern autonomous community of Asturias, a national competitor in terms of cider popularity. Nevertheless, there’s a difference in flavor; Basque-made cider has more acidity and bitterness than sweetness. That acidity is the secret that allows the drinker to enjoy a variety of flavors (as in different pintxos), maintaining an equilibrium in the mouth and creating perfect pairings. “The trick for serving a good cider is the txot – the way of opening the barrel and letting the stream go into the glass,” said Alex, the owner of Sagaretxe. “I’ll tell you a secret: the right angle of the glass lets the gas evaporate, which ensures that it doesn’t end up bitter.” Cider and pintxos (some of which are protected by copyright) are not the only option at Sagaretxe. Aside from the bar, there’s a classic dining room with dark wooden tables and a refined atmosphere, where it’s possible to try other Basque gems such as piquillo peppers filled with cod brandade, marmitako (tuna stew) or suckling pig with txacoli (an acidic, minerally white wine) confit and potatoes that have been smoked and then boiled. 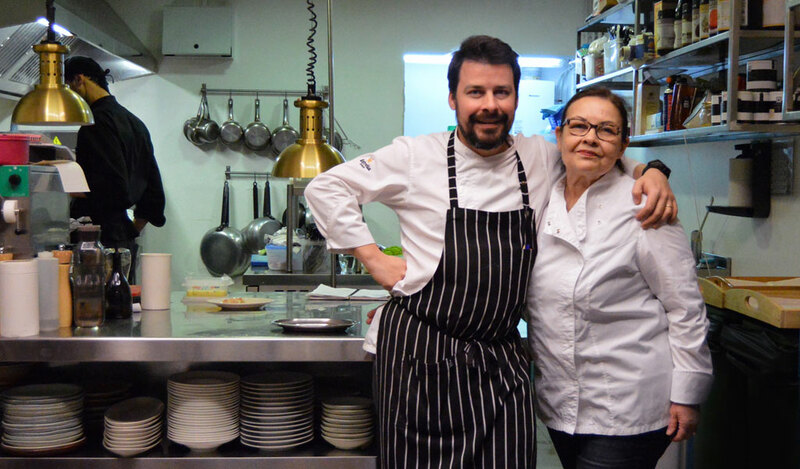 Despite the ubiquity of trendy Basque taverns in Madrid, there’s a reason why Sagaretxe has held onto its fame: it’s the balance it strikes between folksy pintxo and cider bar and perfectionist Spanish restaurant.